St Augustine tells us that the crowds get in the way of people seeing Jesus, they mock the lowly and the poor. But Zacchaeus, a great sinner, desired so much to see Jesus that he found a way to do so, despite the crowd. The wisdom of this world laughs at those who worship a ‘crucified God’; but the wisdom of this world is folly to God. 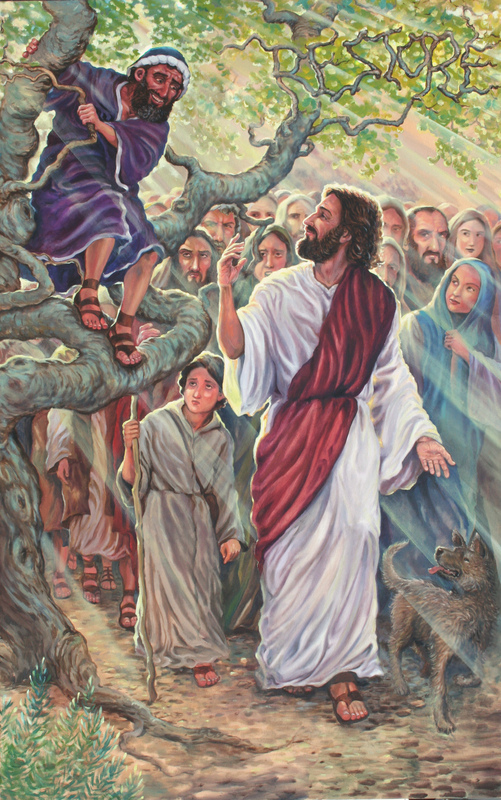 If we would see Him, we too must climb the tree on which He died for us. Zacchaeus was not ashamed to climb the tree and to be mocked; we should be like that. Grace was poured out, St Augustine points out. It was not just that his name was known to Lord, but the Lord also said he would come unto his house. Under its impulse Zacchaeus repents and pays back what he had stolen. That is what it means to welcome Christ. He was already there in the heart of the sinner, and once the sinner repented he was saved. Ephrem the Syrian sees here a parallel with that first fig tree, a symbol of the fall. Here we have the symbol of the resurrection. We rise through Christ and His sacrifice on the tree for us. St Augustine reminds us that Christ came to seek what was lost. All were lost, all have sinned and fallen short. Christ came without sin to save us sinners. The Fathers are agreed that Zacchaeus is the type of the repentant sinner, and they all note not only the fruits of his repentance, but his own search for Christ, a search which led him to make himself a figure of ridicule. We, too, must search for Christ, and we must rise above our sins, and the crowd in our way, and we must be willing to be laughed at; for the wisdom of this world is mere foolishness. Zacchaeus had fallen as far as it was possible. He had worshipped mammon, enriched himself at the expense of the poor and cooperated with the pagan Romans; he was a traitor to his faith and his race. Yet he desired to see Jesus, and that desire led him to salvation. The lesson is plain enough for us all. So sad that many today equate the search for Christ with the pursuit of Mammon. In my country at least I see a polluted mixture. Very true Joseph – let us hope that like Zacchaeus, they come to see the LIght. Peace be unto you my son Chalcedon. As you have mentioned time and time again, that no one knows who is saved and even if we are saved. We have to wait and see. Yes my son, this is the position on the beloved catholic faith. No assurances. Its like a lottery, my son. Everyone will be standing around at judgment hoping their number is called. Many peoples number wont be called. We catholics hope The queen of the universe Mary will pray to get us in. But, lts a turkey shoot. Some hit, some miss. This is the catholic way my children. May Mary guide and keep you. I am disappointed at your demotion, Bosco. What happened to your halo as a saint? Chalcedon my child, i felt Mary called me to the priesthood. I can better serve my catholic fellows by being a guide to their feet and a lamp unto their souls. Saints do nothing but sit around on their clouds playing harps. I want hands on catholicism. I want to be looked up to. I want to fight protestants. There are many perks to being a catholic priest. You have no idea how much money is just sitting there, up for the grabs. May you go in peace my child. PS. You may call me Father from now on when you address me. Go in peace. This morning, Fr. Joe gave us a little background into the mind-set of the people in Christ’s time. The people of that time believed that there was only a certain amount of grain, a certain amount of water, a certain amount of dates etc.. Everything was limited even God’s Grace. We Jews are the lucky ones we have it all…and you others tough luck. Jericho was one of the luckiest both in terms of trade and climate. It’s somewhat akin to Scottsdale, compared to Jerusalem. Herod was smart enough to winter in Jericho. Zacchaeus, a tax collector, a tax collector for the Romans. He is big time ritually unclean and anyone who touches him is unclean and so on and so forth. He is dirty beyond all imagining and on top of that he is rich. He’s gotten more of the universally limited resources. He’s doubly dirty. It’s all sorts of funny as the name Zacchaeus translates to, “Clean”. So Mr. Clean is in point of fact Mr. Dirty. He somehow realizes his soiled condition though a gift of Grace. Jesus recognizes his plight and comes to dine with him. Zacchaeus goes overboard and gives away half his possessions and double what the law requires those he’s fleeced. Jesus forgives him and then saps the onlookers by saying that, “The Son of Man has come to seek and save what was lost,” Not the military overthrow of the Romans. How do we seek Christ? Is it with humility and repentance? Oh my children, Zaccheaus was small potatos compared to the wealth brought in by my beloved catholic church. My fellow priests in germany are enjoying the fruits of the CC to the hilt. There, the reports only a fraction of what it actually takes in. That way the priests are able to live in splendor only a king can enjoy. Its all about the money. If there was no money in it, there would be no clergy. My children, its all about believability. If one believesin the CC one will continue to give money to it and attend its services. I learned, in my days at the Pink Palace, that its all about believability, like the american dollar. You take it because you believe its worth what it says. Same with my beloved CC. We priests are charged with keeping the people believing the CC is gods true church. Scaring the little ones is the start. We tell them its mortal sin to skip a mass. Then we convince the people that we are calling god down from heaven, for their visual pleasure. You see my children, its all about belief. The people are taken in by the costumes and the golden trinkets and the show us priests perform on stage. If the people believe it, they dig deep, and we priests continue to rake in the spoils, and live deliciously. Recently our image took a blow because some busy body journalists decided to report on abuse by priests and such. It forced us to make more sweeping claims, claims that the faithful have been conditioned to believe. You see my children, its all about believability. Go in peace.